School students are watching mock operations, testing surgical skills and watching a patient recovered from a motorbike crash at a special event in Hull today. Year 8 students from Withernsea High, Headlands School in Bridlington and South Hunsley were invited to attend “A Day in the Life of the NHS” to learn about the wide variety of health careers on offer. Six different scenarios from caring for a patient hurt in the traffic accident to watching a patient undergo surgery in a mock operating theatre are being held at the clinical skills department at Hull University Teaching Hospitals NHS Trust. Students from Sirius North, Sirius West and Archbishop Sentamu academies in Hull will take part in a similar event on Friday. Simon Nearney, Director of Workforce at the trust, said: “This is a great event enabling us to reach young people with a passion for health care. 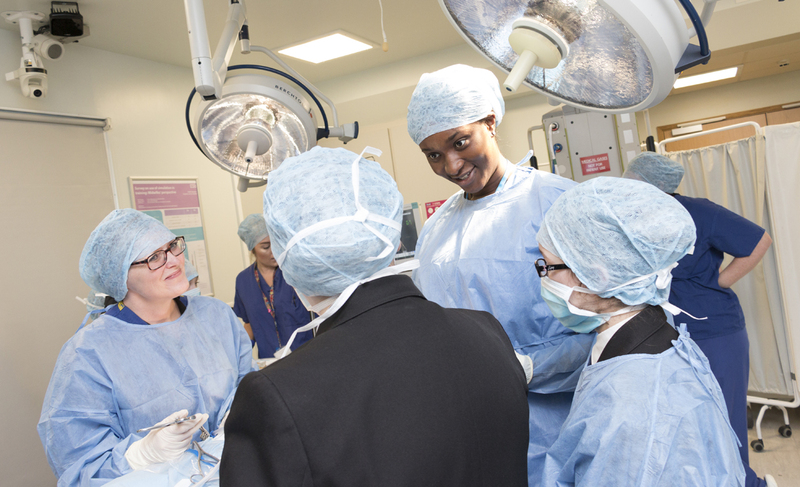 “Whether they’re interested in direct patient care or supporting healthcare staff in other ways, the NHS has career pathways for everyone, not just those with academic qualifications. “Our trust alone employs more than 8,500 people in over 320 different roles including apprenticeships and all of these posts require different levels of experience and qualification so there really is something for everyone. Physics teacher Will Annison accompanied the Year 8 students from Headlands School and welcomed the opportunity to watch classroom learning put into practice during the day-long event. He said: “We have set up our own health academy this year and we’re looking to get these guys enthused about careers in the NHS and fired up and excited about the possibilities. Chloe Middleton, 13, had come with her classmates from Withernsea School.